(Santa Ana) — On Saturday, August 7, Santa Ana parent Elfy Gaona will lace up her walking shoes as she has done for the past seven years one Saturday in August. By 8 a.m., she will join some 300 community volunteers at six high schools in the Santa Ana Unified School District – Century, Saddleback, Santa Ana, Segerstrom, Godinez, and Valley – where they will begin the tenth annual “Camino de Amistad” (Walk for Success). The annual event, organized by Santa Ana College’s “Padres Promotores de la Educación” (Parent Promoters of Education), is designed to increase the visibility of higher education throughout Santa Ana. Parents and high school volunteers canvas neighborhoods as they distribute 20,000 door hangers listing the dates for high school registration and the first day of school. Why does Gaona devote a Saturday to this event? It’s simple. “Children have to prepare themselves to get a better job. Competition is tremendous today. We want our children to know that they can do it,” she said. As the parents and youth volunteers knock on doors, they often find local parents who are anxious for the information, reports Gaona. Besides delivering the door hangers, the walkers share upcoming high school open house dates and they invite parents to visit the Higher Education Center at each of the high schools. 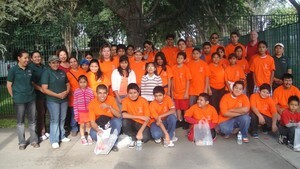 The “Camino de Amistad” volunteers will target neighborhoods where school-to-home communication has been the lowest. High school students who assist with the project can earn community service hours for participating with their parents. A free lunch is provided volunteers following the walk at Adams Park, the corner of Raitt St. and Warner Ave. in Santa Ana. Key partners in the “Camino de Amistad” are the Santa Ana Unified School District, Santa Ana College, Latino Health Access, Delhi Community Center, UC Irvine and CSU Fullerton. For more information about the “Camino de Amistad,” contact Rosa Harrizon at (714) 564-6450 (office) or at (714) 726-6532 (mobile). Parent promoters actively link parents to school services and deliver information on higher education to the community through non-traditional methods such as home visits, existing neighborhood associations, and informal educational dialogues. The program began in 2001 and is administered by Santa Ana College. All nine Santa Ana Unified School District (SAUSD) middle schools and six comprehensive high schools participate in the program. Since 2001, more than 400 parents from Santa Ana have been trained and served as “Promotores de la Educación” and more than 9,775 home visits have been conducted, as well as 800 community-based forums. The mission of the Rancho Santiago Community College District (RSCCD) is to respond to the educational needs of an ever-changing community and to provide programs and services that reflect academic excellence. Santa Ana College and Santiago Canyon College are public community colleges of RSCCD, which serve the residents of Anaheim Hills, East Garden Grove, Irvine, Orange, Santa Ana, Tustin and Villa Park. Both colleges provide education for academic transfer and careers, courses for personal and professional development, customized training for business and industry, and programs to train nurses, firefighters and law enforcement personnel.